Craps is a dice game based solely on luck, is one of the simplest games available at a casino, despite its image as a rowdy, complicated pastime. In fact, craps is one of the most sought-after games in the online casino world today. There are many unique terms and phrases surrounding the game of craps, which players may want to read up on. The general understanding is that craps originated as a 12th century English game called Hazard. By the 1600’s, however, the game had metamorphasized into the French game of “Crabes” and surged in popularity throughout Europe. After the game reached North American shores, it was given ‘official’ status when John H. Winn wrote a set of rules for craps in the 1900’s. 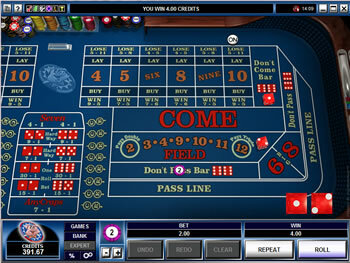 Craps is traditionally played around a custom craps table, and is played against the house. Players gather around this table, with the sole objective of craps being to wager on the outcome of two dice being thrown. There are numerous betting options and variations available, which players need to familiarize themselves with first. Once the bets have been placed, the dice are thrown and the dealer pays out any winning combinations. The general rules of online craps are very much the same as those played in land based casinos. You can find out much more about Craps by reading the detailed description of craps at Wikipedia. For more details on the rules and the scoring when you play craps , you can view our craps rules page.